For other uses, see Oswego (disambiguation). Oswego /ɒsˈwiːɡoʊ/ is a village in Kendall County, Illinois, United States. The village population as of the 2010 census was 30,355, more than double its population of 13,326 in 2000. Oswego is the largest municipality located completely within Kendall County. In 1833, William Smith Wilson, his wife Rebecca, and his brother-in-law Daniel Pearce moved to the area now known as Oswego. The land belonged to the local Potawatomi, Ottawa, and Chippewa tribes, but the United States government removed the Native Americans when the government started surveying the land along the Fox River in Kendall County. In 1842, the federal government placed the land for sale at an established price of $1.25 an acre. After the sale of the land, Lewis Brinsmaid Judson and Levi F. Arnold from New York laid out the village and named it "Hudson". However, when a post office was established, its location was given as "Lodi". Confusion over the official name of the area led to a decision in January 1837, when the citizens gathered and voted "Oswego" as the permanent name of the village by a single vote. The ford across the Fox River in the town allowed Oswego to grow economically and as a town, eventually incorporated in 1852 with its village boundaries at the time being Harrison Street to the northwest, Jefferson Street to the northeast, Monroe Street to the southeast, and Benton Street to the southwest. At the advent of the automobile, Oswego continued to see growth as it became a hub for three different state highways (Illinois Route 25, Illinois Route 71, and Illinois Route 31). Major community developments began when Caterpillar Inc. and Western Electric built industrial plants near Oswego in the mid-1950s. This initially allowed nearby Boulder Hill to develop. The next major development arrived in the mid-1980s during the suburban homebuilding boom, which allowed houses and buildings to populate the village. The rapid growth of the village allowed its limits to expand west of the Fox River into today's boundaries. Oswego is known to some Chicago area residents for the town dragstrip, open from 1955 until 1979, where muscle cars were raced by drivers from all over the Midwest. The drag days are celebrated today even though the strip has been closed for decades. Oswego is located in northeastern Kendall County on the Fox River. It is bordered to the north by Boulder Hill and Montgomery, to the east by Aurora, and to the west by Yorkville, the Kendall county seat. According to the 2010 census, the village of Oswego has a total area of 15.63 square miles (40.5 km2), of which 15.53 square miles (40.2 km2) (or 99.36%) is land and 0.11 square miles (0.28 km2) (or 0.70%) is water. Downtown Oswego is home to historic buildings and homes, as well as shops and restaurants. The village of Oswego launched a project to enhance and restore the historic downtown district. This project included significant infrastructure and streetscape improvements, such as the installation of brick pavers, sidewalks, landscaping, and decorative streetlights and benches. Hudson Crossing Park, located along the Fox River, opened in October 2004 where many children and families enjoy the scenery. The Waubonsee Creek Promenade, which stretches from Main Street to the new park, is the final phase of the downtown enhancements. In 2008, the village celebrated its 175th anniversary. The Oswego area is home to over 1,100 acres (450 ha) of open land, trails, and parks maintained by the Oswegoland Park District. Established in 1950, this governmental agency is guided to "create opportunities for a healthy community". Overseeing 63 parks, 16 miles (26 km) of walking trails, two aquatic parks, and the Little White School Museum, the park district provides offerings for the community of 20,000 households as well as visitors from farther away. The Oswego area holds several races for fitness enthusiasts. Several area festivals are coordinated by the park district, such as the annual PrairieFest. As of the census of 2010, there are 30,355 people, 9,935 households, and 8,027 families residing in the village. The population density is 2,025/mi² (782/km²). There are 10,388 housing units at an urban density of 668.9/mi² (258.3/km²). The racial makeup of the village is 85.65% White, 5.16% African American, 0.24% Native American, 3.43% Asian, 0.03% Pacific Islander, 3.24% from other races, and 2.24% from two or more races. 11.71% of the population are Hispanic or Latino of any race. There are 9,935 households out of which 50.3% have children under the age of 18 living with them, 69.2% are married couples living together, 10.58% have a female householder with no husband present, and 19.2% are non-families. The average household size is 3.08 and the average family size is 3.43. In the village, the population is spread out with 34.7% under the age of 20, 17.0% from 20 to 34, 33.2% from 35 to 54, 8.3% from 55 to 64, and 6.8% who are 65 years of age or older. The median age is 33.9 years. As of the 2000 census, the median income for a household in the village is $71,502, and the median income for a family is $75,929. Males have a median income of $55,580 versus $32,484 for females. The per capita income for the village is $27,204. 2.8% of the population and 1.6% of families are below the poverty line. Out of the total population, 3.4% of those under the age of 18 and 3.8% of those 65 and older are living below the poverty line. The Oswego Community Unit School District 308 serves Oswego, Boulder Hill, Montgomery, Plainfield, Aurora, Yorkville and Joliet. It operates 22 schools, including one early learning center, 14 elementary schools for grades K-5, 5 junior high schools for grades 6-8, 2 high schools, and one opportunity school. Portions of Oswego are within Yorkville Community Unit School District 115, which operates Yorkville High School. Oswego was ranked #58 in 2011 on CNN/Money Magazine’s Top 100 Best Towns to live. CNN Money ranks these towns based on their job opportunities, schools, safety, economic strength, and other qualities. Kendall County has continuously been ranked as one of the fastest-growing counties and a place of rapid job growth. ^ "Geographic Identifiers: 2010 Demographic Profile Data (G001): Oswego village, Illinois". American Factfinder. U.S. Census Bureau. Retrieved February 22, 2019. ^ a b c "History". OswegoIL.org. Retrieved 15 December 2014. ^ Matile, Roger (April 30, 2008). "2". Oswego Township. Arcadia Publishing. p. 23. ISBN 0738552089. ^ Matile, Roger (April 30, 2008). Oswego Township. Arcadia Publishing. p. 7. ISBN 0738552089. ^ Roger, Matile (2008). Oswego Township. Charleston, SC: Arcadia Pub. p. 8. ISBN 0738552089. ^ Dardick, Hal (January 2, 1991). "Boulder Hill has it all but a town that it can call its own". Chicago Tribune. Chicago Tribune. Retrieved 28 June 2016. ^ Alaimo, Salvatore (August 24, 2011). "Oswego Dragstrip in Oswego, Illinois Holds Many Drag Racing Memories". Dragzine. Power Automedia. Retrieved 28 June 2016. ^ Lohnes, Brian (July 27, 2011). "Wednesday Time Killer: Awesome Photos and History From Oswego Dragway, Including Grumpy Jenkins Wreckage!". BangShift.com. Retrieved 28 June 2016. ^ Antinori, Shannon (July 14, 2014). "New Museum Exhibit Highlights Oswego Drag Raceway". Oswego Patch. Patch Media. Retrieved 28 June 2016. 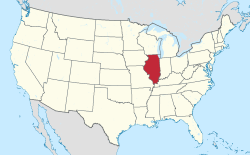 ^ "2010 Census U.S. Gazetteer Files for Places – Illinois". United States Census. Retrieved 2012-10-13. ^ Brack-Johnson, Ann (November 24, 1998). "Oswego Looks Creekward". Chicago Tribune. Chicago Tribune. Retrieved 28 June 2016. ^ a b c d "American FactFinder". United States Census Bureau. Retrieved 2016-06-27. ^ "Oswego Demographic Profile - March 2015.pdf" (PDF). Oswego, Illinois. Esri. Retrieved 28 June 2016. ^ "District Building Information". Community Unit School District 308. ^ "About Our School District" (Archive). Yorkville Community Unit School District 115. Retrieved on June 9, 2015. ^ "Rob Baxley". profootballarchives.com. Retrieved June 27, 2016. ^ "Rita B. Garman, Supreme Court Chief Justice: Fourth District". IllinoisCourts.gov. Retrieved June 27, 2016. ^ "Joey Goodspeed". Scout. Scout.com. Retrieved 28 June 2016. ^ Newton, M. (2002). The Encyclopedia of Robberies, Heists, and Capers. Checkmark Books, an imprint of Facts on File, Inc. ISBN 0-8160-4489-9. pp. 128-129. ^ "HASTERT, John Dennis". History, Art, and Archives. United States House of Representatives. Retrieved 28 June 2016. ^ "Alex Magee". NFL. NFL Enterprises LLC. Retrieved 28 June 2016. ^ "Money Magazine "Best Places to Live 2011"". BestPlaces.net. Retrieved 15 December 2014. ^ Christie, Les (16 June 2010). "Fastest growing counties in the U.S." Retrieved 15 December 2014.